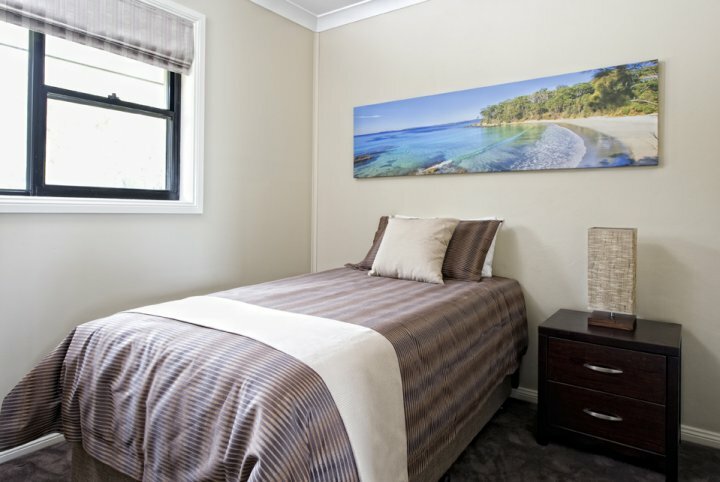 Dolphin Shores, Jervis Bay is the only four star rated motel in the Jervis Bay area. 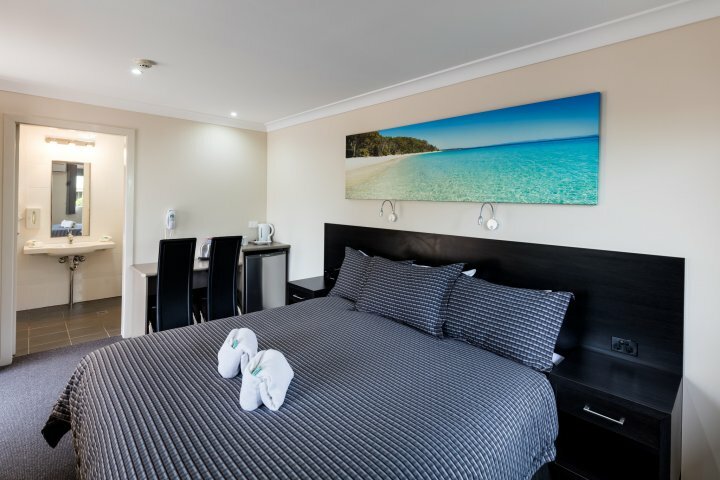 We are just a short stroll from the whitest sands in the world on Jervis Bay's Collingwood Beach, and only a few minutes walk from the local Vincentia restaurants and shops. 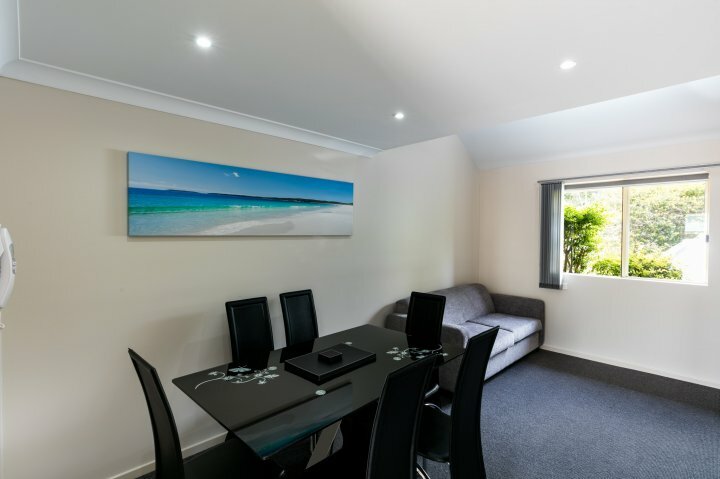 A short drive will get you to Huskisson, HMAS Creswell, Hyams Beach, Booderee National Park, and many other nearby attractions. 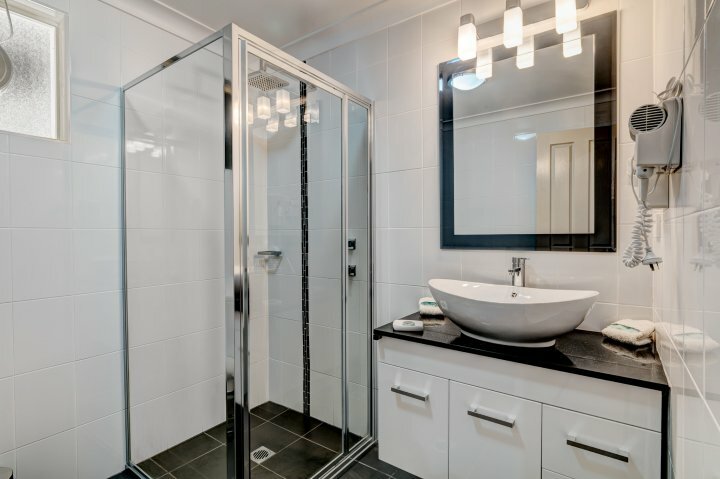 We offer eight different types of rooms, Standard Rooms, Self Contained Rooms, Two Story Loft Apartments, Standard Spa Rooms, Deluxe Spa Rooms, Spa Suite, Luxury Two Bedroom Spa Villas and a Luxury Three Bedroom Town House. Andrew, the owner /resident manager and all his friendly and staff, look forward to welcoming you during your next Jervis Bay holiday! 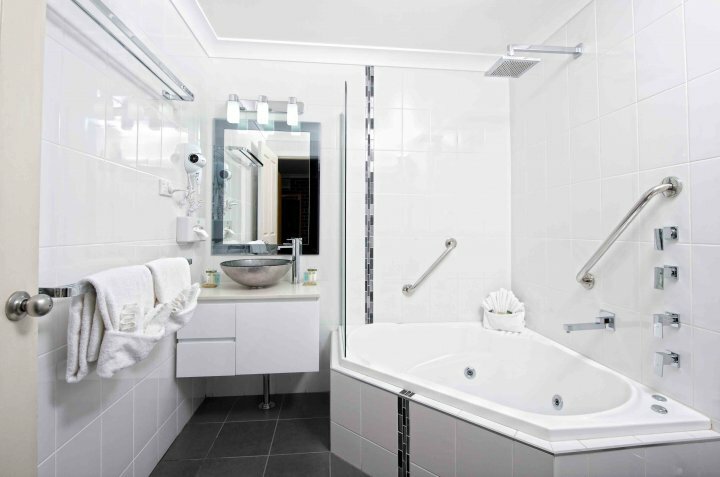 The deluxe spa room has a king size bed, a spacious corner spa in the bathroom, two 32" LCD TVs with inbuilt DVD players, sofa/lounge that opens to a queen, latex mattress bed, kitchenette(two burner hotplate, microwave, refrigerator, sink, cutlery, crockery, toaster and jug) and dining setting for four. Rate is based on a maximum of two people sharing a king size bed. A tariff of $30.00 per night is charged for any additional person. 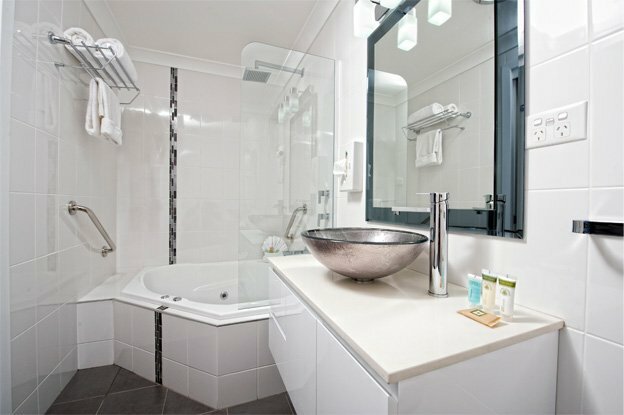 The deluxe spa room has a king size bed, a spacious corner spa in the recently renovated bathroom, remote television, sofa/lounge that opens to a queen, sprung mattress bed, kitchenette(two burner hotplate, microwave, refrigerator, sink, cutlery, crockery, toaster and jug) and dining setting for four. Rate is based on a maximum of two people sharing a king size bed. A tariff of $30.00 per night is charged for any additional person. 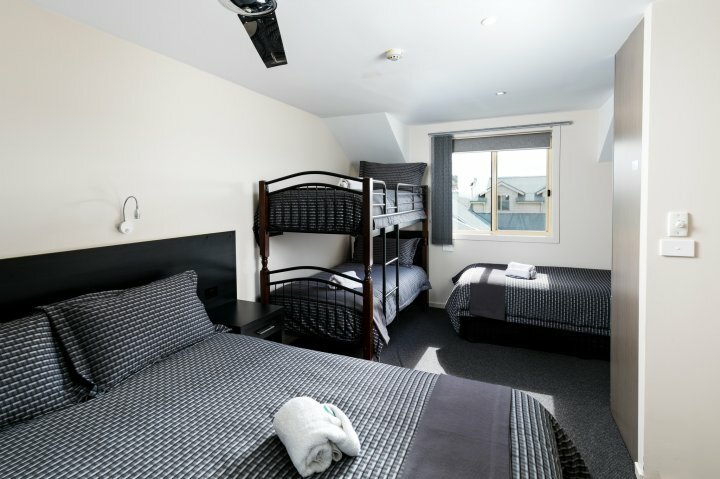 The two-storey loft apartments consist of a queen bed and 2 single beds upstairs in one, open area (two apartments with a queen, a single and a set of bunks). 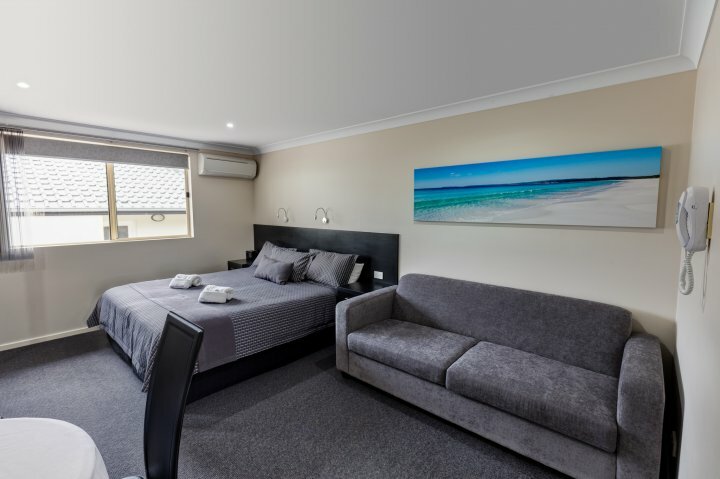 Downstairs there is a queen sofa bed with latex mattress, 32" LCD TV with DVD player, dining setting, bathroom, reverse-cycle air conditioning and a fully self contained kitchen. 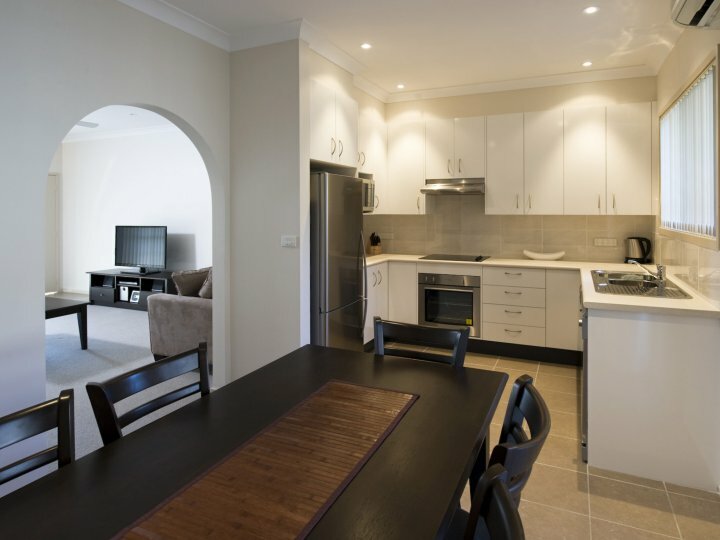 Kitchen has a full size fridge, four hotplate glass cook-top, under-bench oven and microwave oven. Rate is based on a maximum of two people sharing a queen size bed. A tariff of $30.00 per night is charged for any additional person. 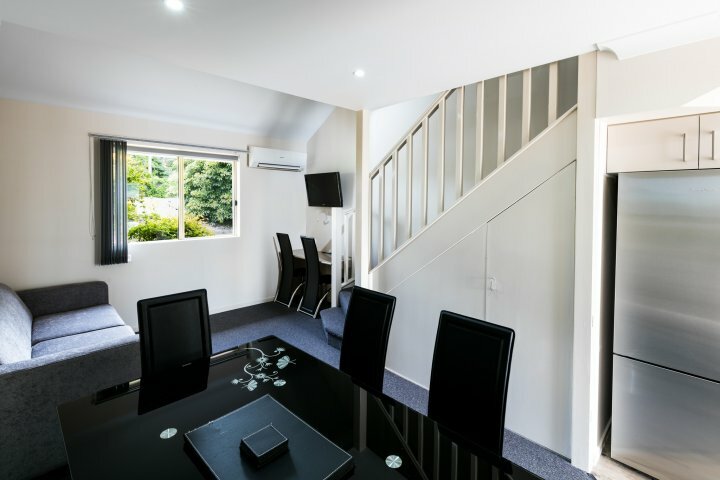 We have two Loft Apartments that can sleep seven people but you will need to call us to check availability and book over the phone. Our Luxury Three Bedroom Town Houses are approximately seven years old, have three bedrooms, two large bathrooms (one with a deep corner bath), a fully self contained kitchen with dishwasher, dining setting for eight, corner lounge that folds out to a queen sofa-bed, balcony with an outdoor setting for eight and stainless BBQ, laundry with washing machine and dryer and a double garage. We have spared no expense in making this accommodation comfortable and luxurious. 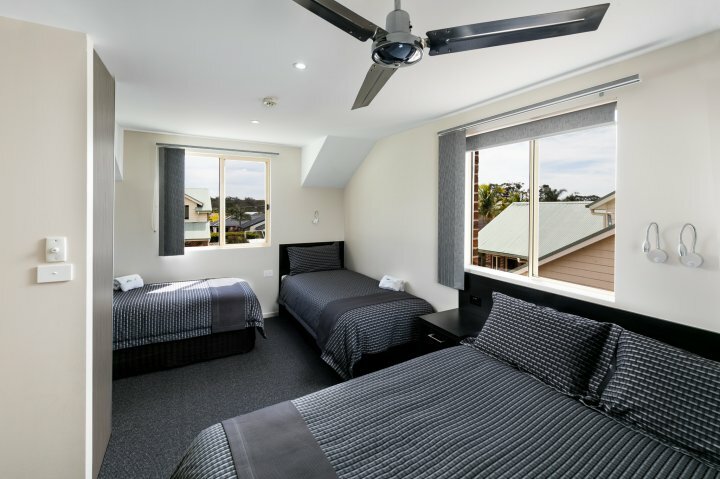 Rates based on a double basis (up to 2 people sharing same bed). For each additional person, a $30.00/person/night charge is applied. As our newest addition, the Town Houses are approximately five years old, have three bedrooms, two large bathrooms (one with a deep corner bath), a fully self contained kitchen, dining setting for eight, corner lounge that folds out to a queen, sprung mattress sofa-bed, balcony with an outdoor setting for eight and stainless BBQ, laundry with washing machine and dryer and a double garage. 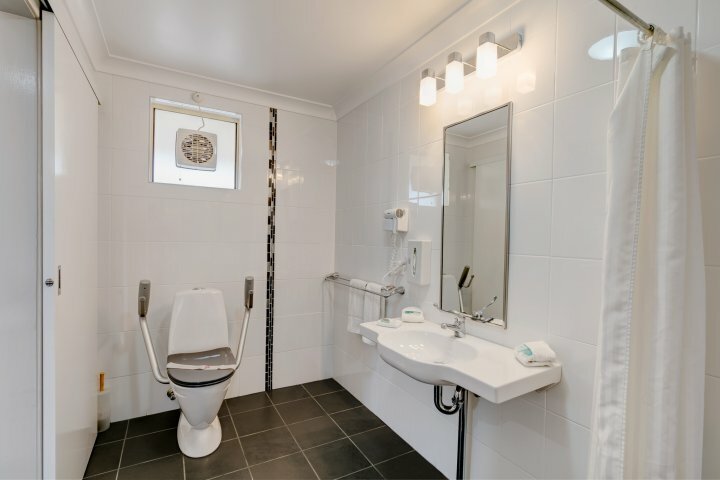 We have spared no expense in making this accommodation comfortable and luxurious. 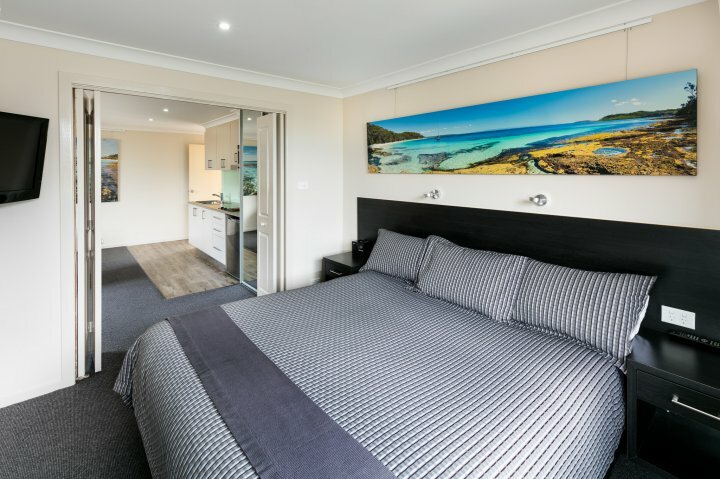 Rates based on a double basis (up to 2 people sharing same bed). 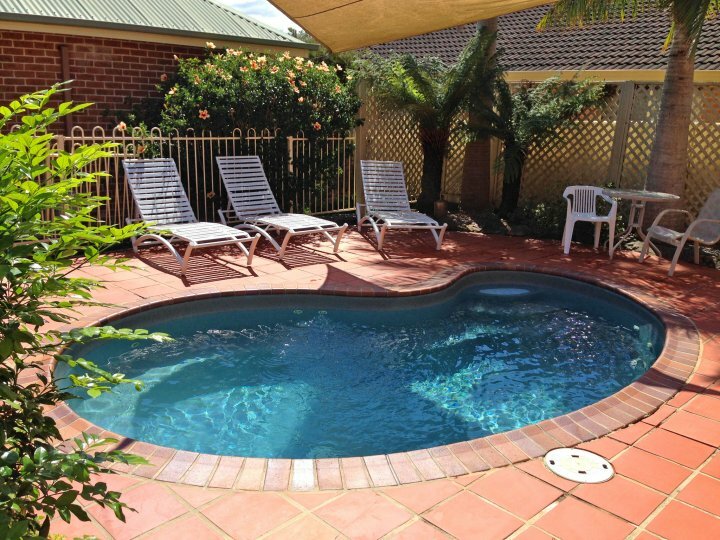 For each additional person, a $30.00/person/night charge is applied. 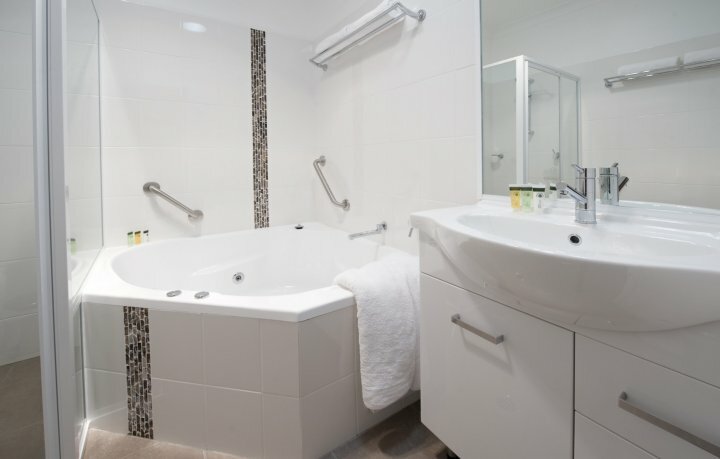 Our Luxury Spa Villa has two bedrooms, one with a king size bed (can be split into two long singles) and one with two long singles (can be joined into another king).There are two split-cycle air conditioning systems servicing the main bedroom and living areas. 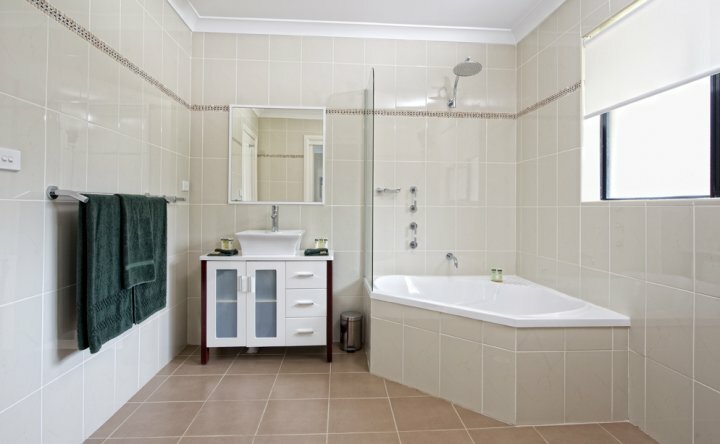 The bathroom has a corner spa and a separate shower recess. 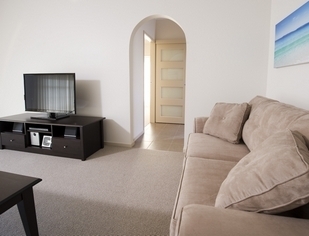 The lounge room has a three-seat lounge (folds out to a queen size bed) and a two seat lounge, HD television, DVD and stereo system. 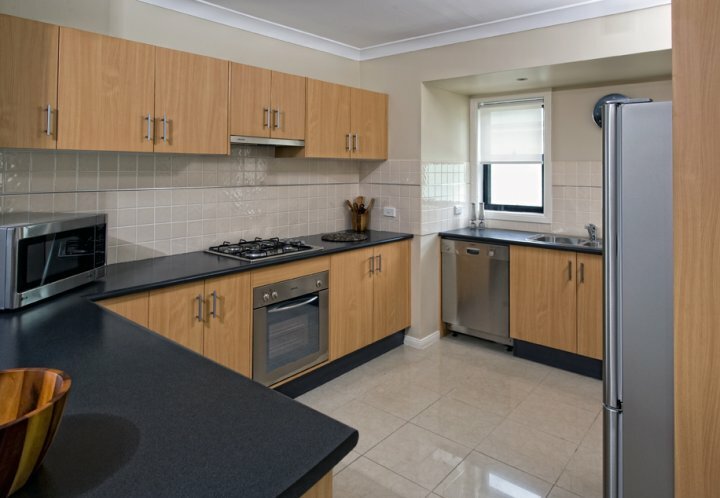 The kitchen is fully self contained with cook-top, under-bench oven, range-hood and dishwasher. The dining room has a six place dining table. 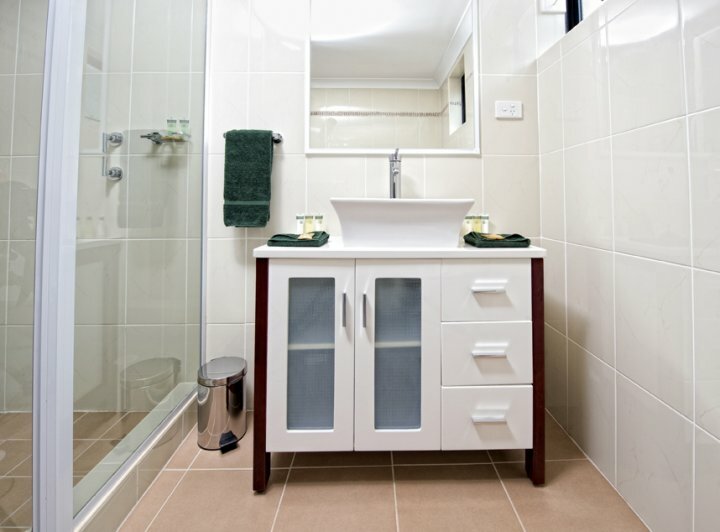 The laundry is equipped with a washing machine and drier. 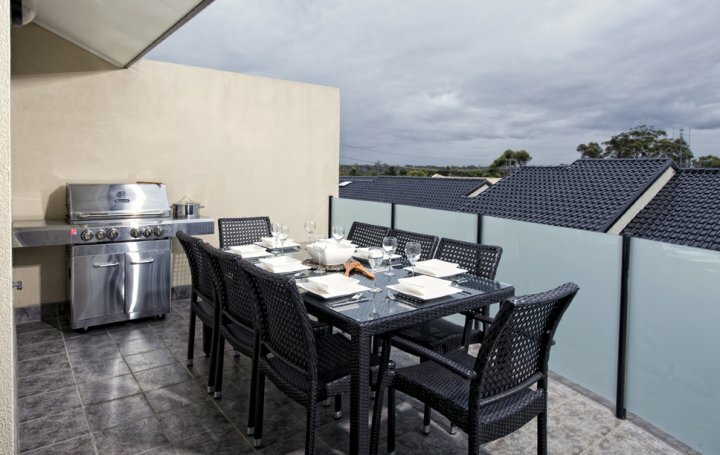 The rear courtyard with has a LPG BBQ and a 6 seat outdoor setting. The rate is based on a maximum of two people sharing the king size bed. A tariff of $30.00 per night is charged for any additional person. 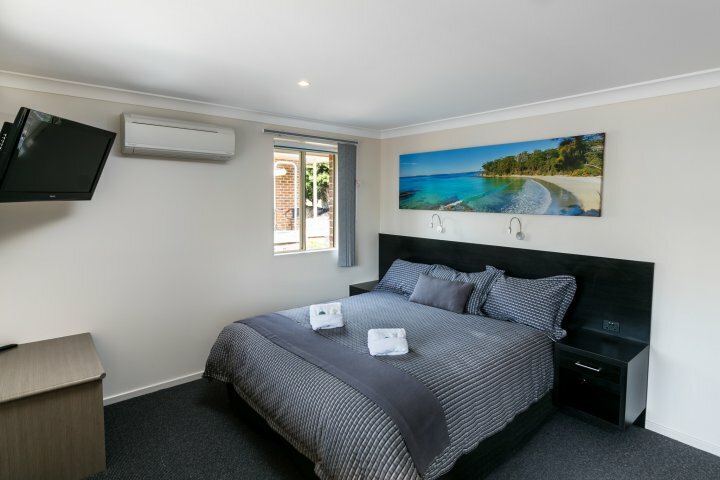 Our 'new' Luxury Villa has two bedrooms, one with a king size bed (can be split into two long singles) and one with two long singles (can be joined into another king).There are two split-cycle air conditioning systems servicing the main bedroom and living areas. 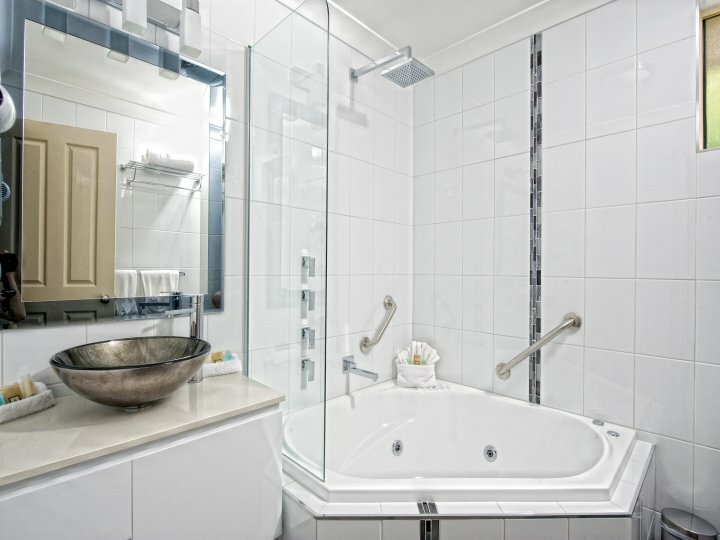 The bathroom has a corner spa and a separate shower recess. 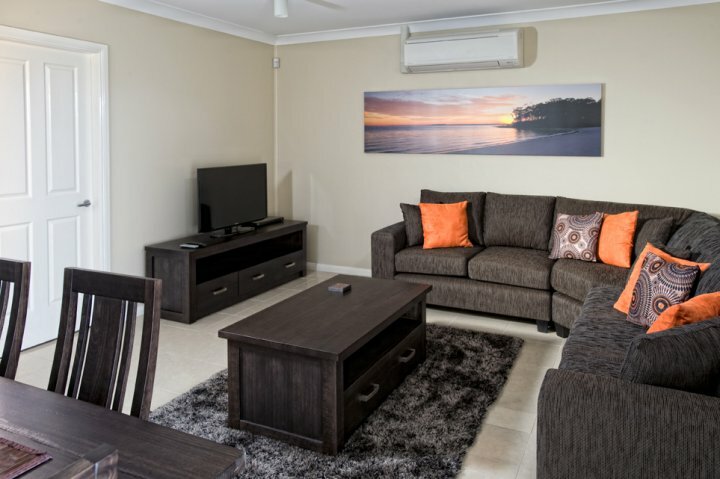 The lounge room has a three-seater lounge (folds out to a queen size bed) and a two seater lounge, HD television, DVD and stereo system. The kitchen is fully self contained with cook-top, separate oven, range hood and dishwasher. The dining room has a six place dining table. The laundry is equipped with a washing machine and drier. 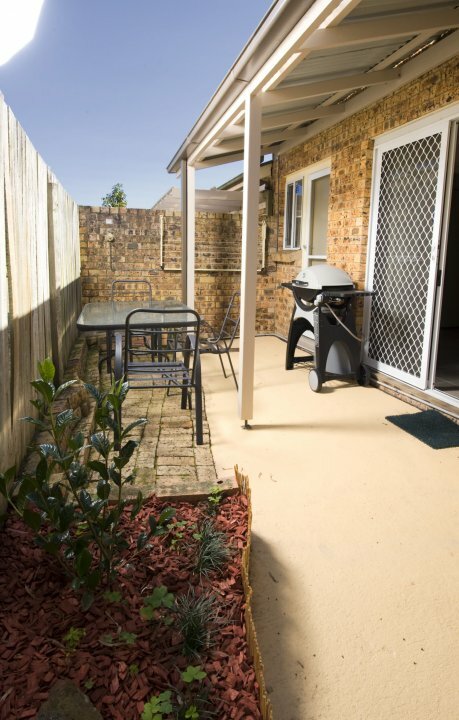 The rear courtyard with has a LPG BBQ and a 6 seat outdoor setting. The rate is based on a maximum of two people sharing the king size bed. A tariff of $30.00 per night is charged for any additional person. 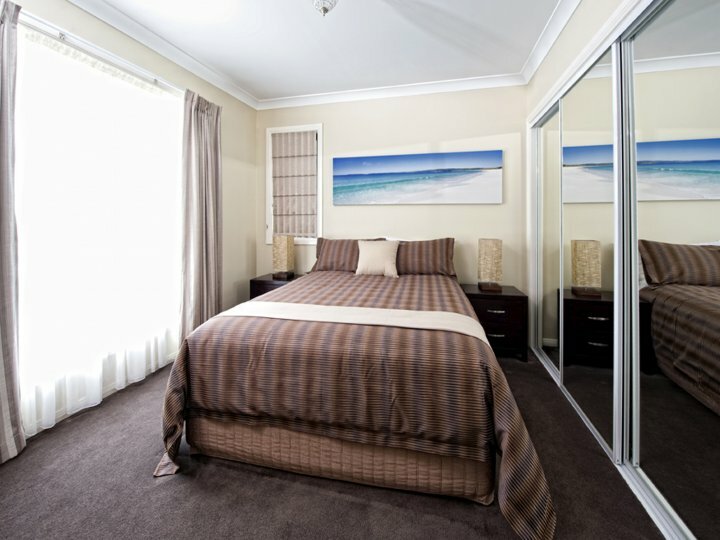 The self-contained rooms have a king size bed and a sofa/lounge that converts into a queen, latex mattress bed. 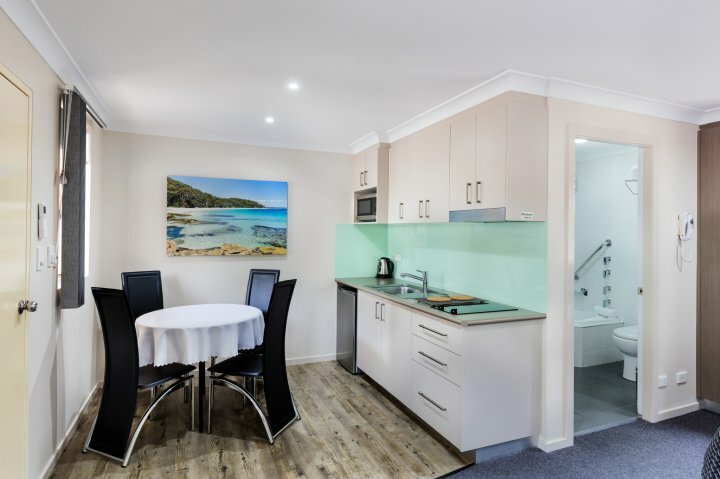 These rooms also have a kitchenette with a two burner hotplate, microwave, refrigerator, cooking utensils and sink, 32" LCD TV with a built-in DVD player, dining setting for four, coffee/tea and toast making facility and bathroom. Rate is based on a maximum of two people sharing a king/queen size bed. A tariff of $30.00 per night is charged for any additional person. 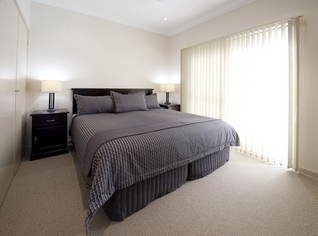 The self-contained rooms that have a king size bed and a sofa/lounge that converts into a queen, sprung mattress bed. 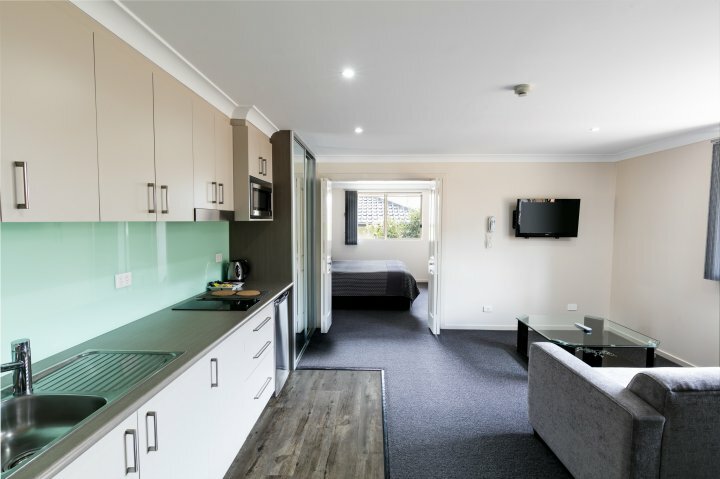 These rooms also have a kitchenette (two burner hotplate, microwave, refrigerator, cooking utensils and sink), remote television, dining setting, coffee/tea and toast making facility and bathroom. Rate is based on a maximum of two people sharing a king/queen size bed. A tariff of $30.00 per night is charged for any additional person. 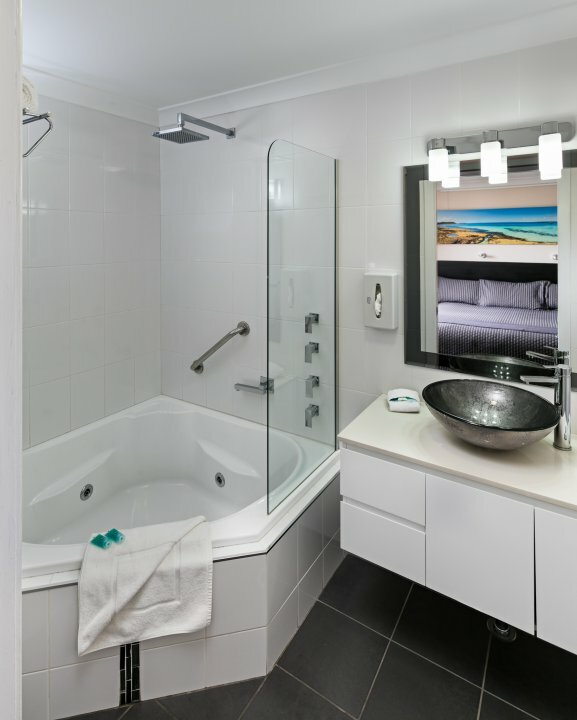 Our Standard Spa rooms consist of a king size bed, individual reverse-cycle air conditioning, coffee, tea and toast making facilities, refrigerator, 32" LCD TV with DVD player, balcony and a spacious corner spa in the bathroom. Rate is based on a maximum of two people sharing a king size bed. A tariff of $30.00 per night is charged for any additional person. 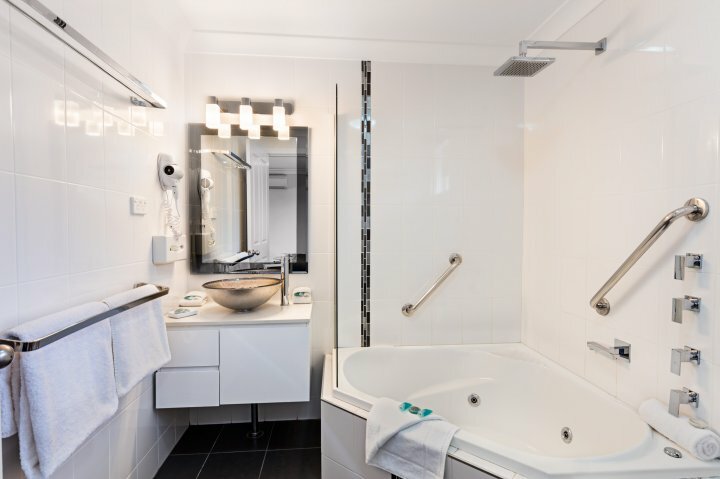 Recently renovated our standard spa rooms consist of a delux king size bed, individual reverse-cycle air conditioning, coffee, tea and toast making facilities, refrigerator, television, DVD player, balcony and a spacious corner spa in the bathroom. Rate is based on a maximum of two people sharing a king size bed. A tariff of $30.00 per night is charged for any additional person. The spa suite is our nicest spa room. 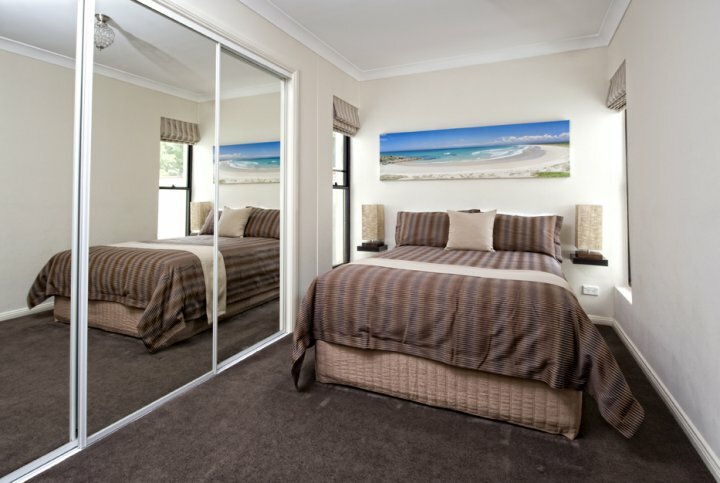 It has a king size bed in the bedroom with 32" LCD TV and a spacious corner spa in the en-suite bathroom. 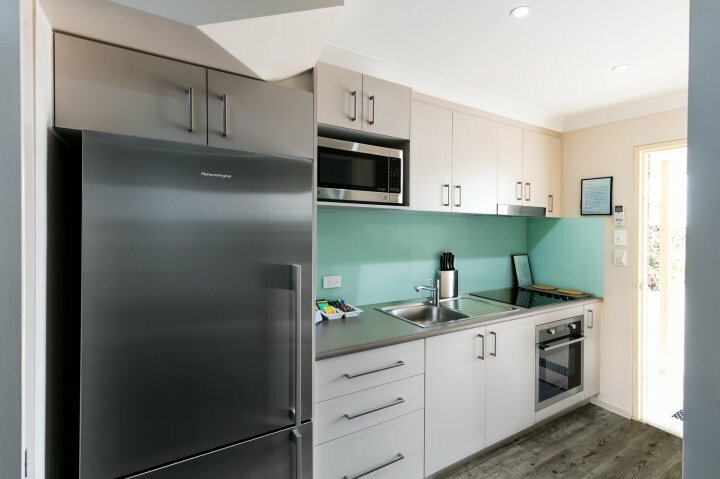 The separate open living area has a 32" LCD TV with built-in DVD player, a sofa-bed with a latex mattress, a kitchenette with a two hotplate cook-top, microwave, refrigerator, sink, cutlery, crockery, toaster and jug and a dining setting for four. Rate is based on a maximum of two people sharing a king/queen size bed. A tariff of $30.00 per night is charged for any additional person. The spa suite is our nicest spa room. 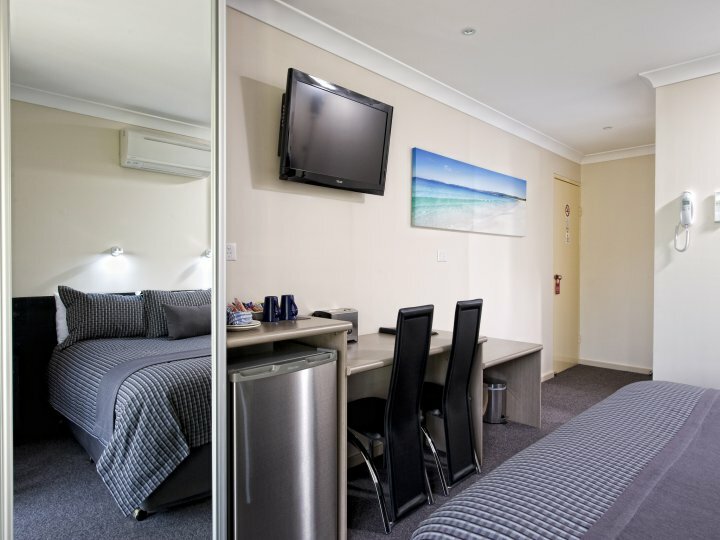 It has a king size bed in the bedroom, a spacious corner spa in the en-suite bathroom which has been recently renovated, and a separate open living area with remote television and DVD player, queen latex sofa-bed, kitchenette (two burner hotplate, microwave, refrigerator, sink, cutlery, crockery, toaster and jug) and dining setting for four. Rate is based on a maximum of two people sharing a king/queen size bed. A tariff of $30.00 per night is charged for any additional person. 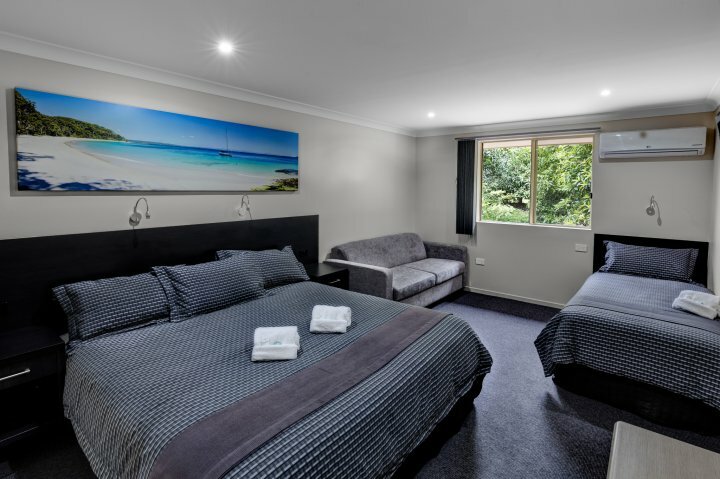 Two of our standard rooms consist of a king size bed, two standard rooms have a king and a single, and two have a king, a single and a sofa that folds out to a queen size latex bed. 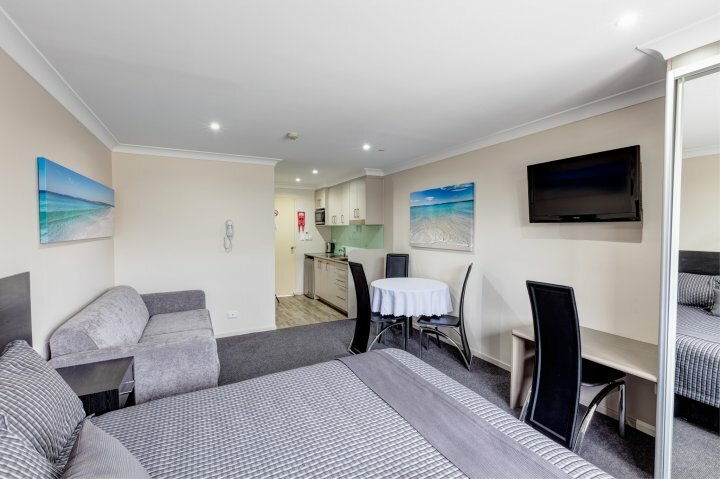 All of our Standard Rooms have a 32" LCD TV with built-in DVD player, coffee/tea and toast making facilities, refrigerator, reverse-cycle air conditioning and a bathroom with a shower recess. Rate is based on a maximum of two people sharing a king size bed. A tariff of $30.00 per night is charged for any additional person or extra bed that is utilised. 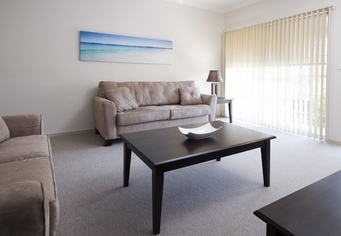 If you require a Standard Room for four or more people, please call us to check availability. 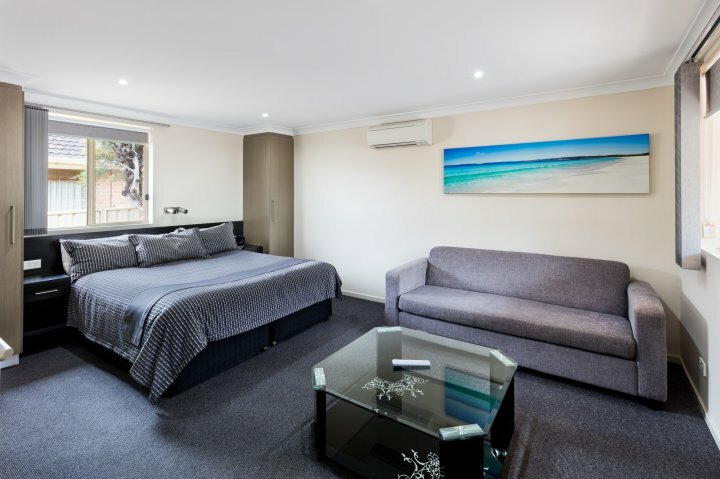 Two of our standard rooms consist of a king size bed, two standard rooms have a king and a single, and two have a king, a single and a sofa that folds out to a queen size latex bed. 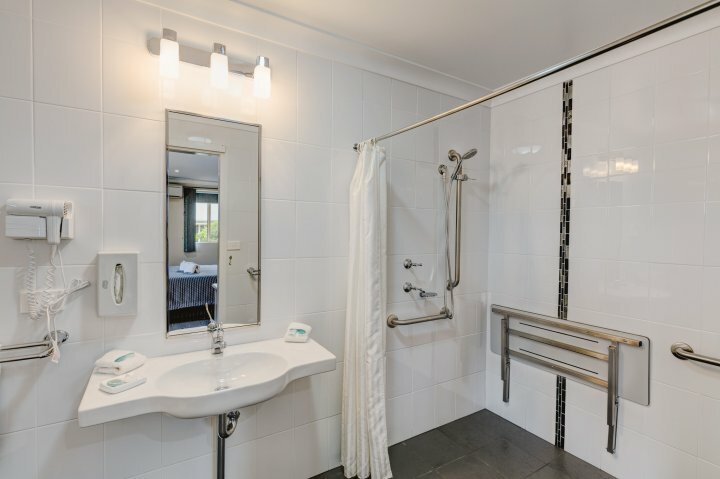 All of our Standard Rooms have a remote television, DVD player, coffee/tea and toast making facilities, refrigerator, reverse-cycle air conditioning and a bathroom with a shower recess. Rate is based on a maximum of two people sharing a king size bed. 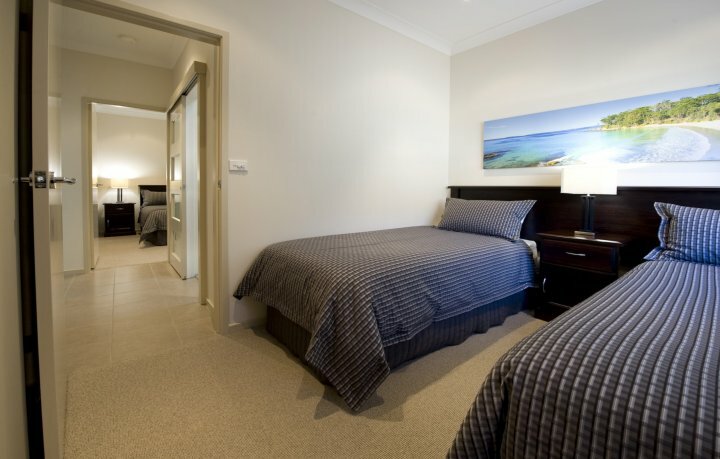 A tariff of $30.00 per night is charged for any additional person or extra bed that is utilised. 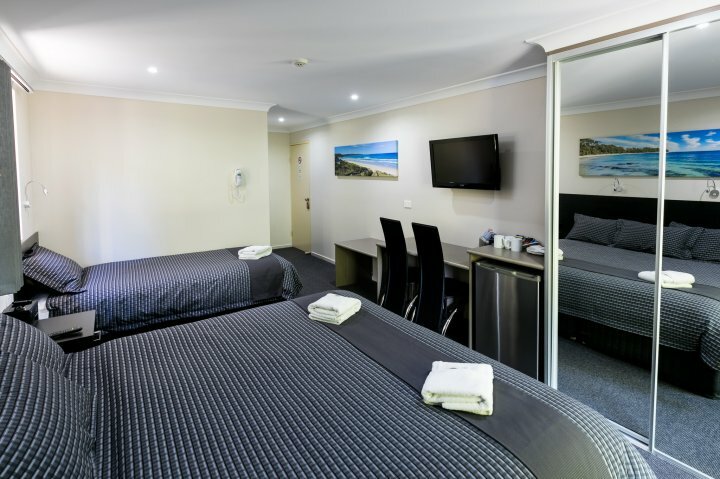 If you require a Standard Room for four or more people, please call us to check availability. 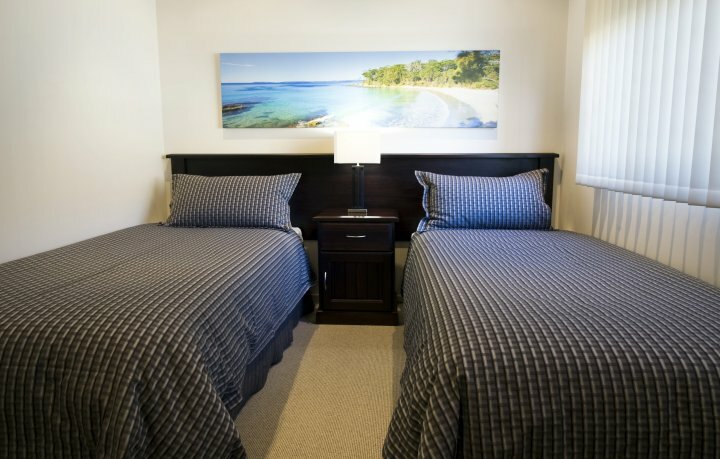 Room rates are for two adults, an additional charge of $30 per night is charged for additional guests. Cots are available for hire at $22.00 for up to 3 days use. Car parking available. Additional parking for boats and trailers can be arranged on request. 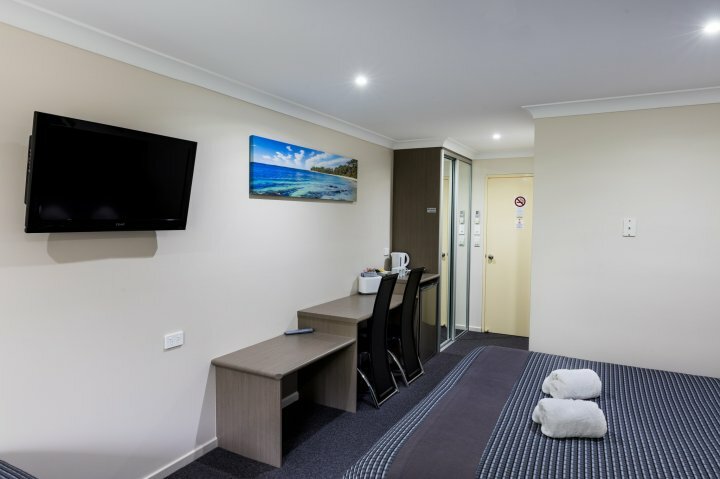 * Drive south on the Princess Highway and over the Shoalhaven River at Nowra. * At the first set of traffic lights over the bridge (ex-Navy Helicopter sitting on a pole on your left hand corner) travel south on the Princes Highway for 13.4km (approx 12 minutes. * Turn left onto Jervis Bay Road and drive 13.9km (approximately 10 minutes)until you come to the first roundabout. * Turn left onto The Wool Road and drive 1.6km turning left into Beach Street. * We are located 150m on your left. * Whilst travelling north on the Princess Highway you will pass the Sussex Inlet turnoff (Sussex Inlet Road). * Travel 9.8km north and turn right onto Island Point Road. 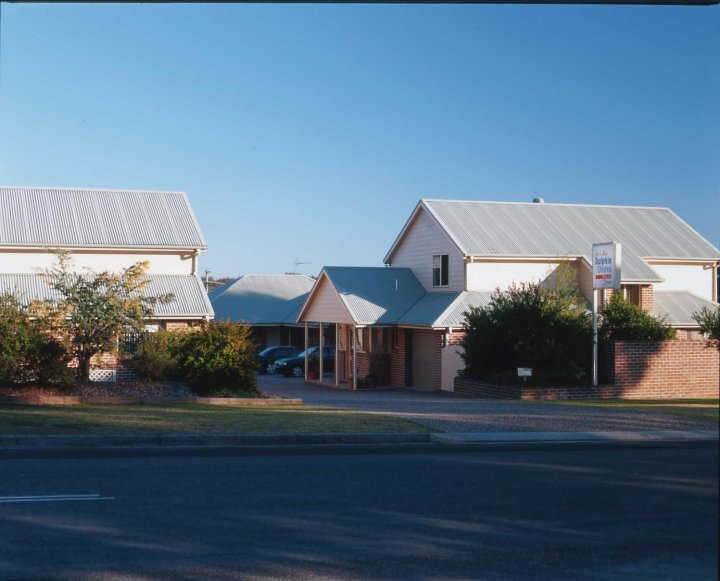 * Drive 11.4kms (road becomes The Wool Road after about 3kms) and turn left onto Beach Street.